Integrated Banding Part Number Builder! FilConn integrated banding platform connectors are leading the industry in cable harness improvement for both shielded and unshielded cables. Our IBP connectors reduce the overall profile of the traditional multiple component configuration by 60% and also reduce the total weight by 40%. This space and weight savings is very easily achieved by building our banding platform or saddle clamp into the body of the connector for a very simple and extremely functional one piece design. This technology also allows for a drastic reduction in total part number count while at the same time providing the best possible EMI/RFI grounding available. 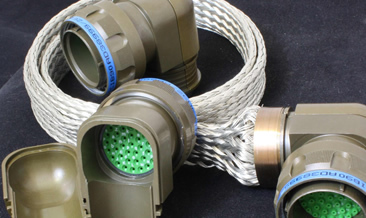 FilConn IBP connectors are available in every mil-spec series and in strait, 45, and 90 degree design ensuring that limited space will never again limit the performance or capability of your cables.